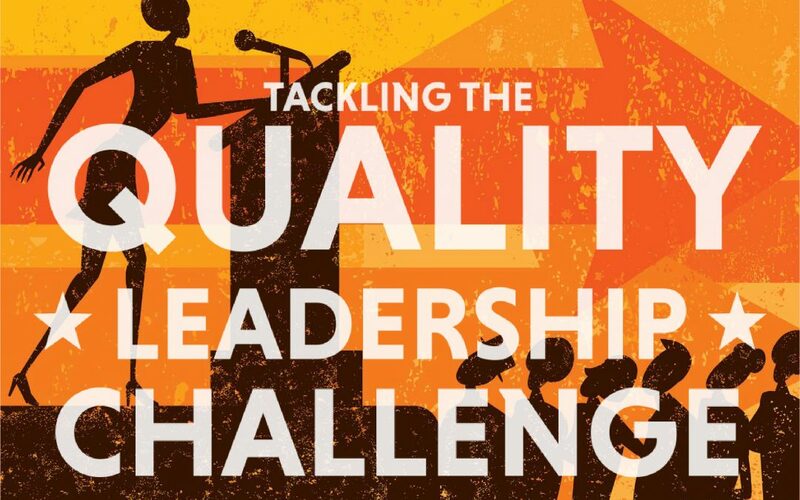 Boosting female representation can help close the leadership talent gap. While the number of female CEOs at Fortune 500 companies is rising, they still only constitute 5.4 percent. A recent study by Grant Thornton, “Women in Business: Turning Promise Into Practice,” showed that one-third of global businesses had no women in senior management roles as of 2017 and that this had not changed since 2011. A 2016 comprehensive study by Mercer, “When Women Thrive, Businesses Thrive,” showed that women make up only 35 percent of the average company’s workforce at the professional level and above and that female representation declines as career level rises. How can CLOs help leaders — both male and female — develop at a deeper level, personalized to their specific needs? In 2014, my organization, Tucker International, published a peer-reviewed study of 1,880 global leaders representing nine nationalities titled “Leading Across Cultures in the Human Age: An Empirical Investigation of Intercultural Competency Among Global Leaders.” One-third of these leaders were women. Nationalities included American, Australian, Belgian, British, Canadian, Chinese, French, German and Indian. These leaders were screened to only include those with top executive responsibility for their organizations; profit and loss responsibility; and responsibility for a group of businesses or top executive responsibility for their business function. Global leadership success among these leaders was measured by their ability to drive performance, build team effectiveness and network globally. A set of nine intercultural competencies were measured, which successfully predicted leadership success over time. These competencies were grouped into three broad categories — world view, situational approach and social/interpersonal style. Instilling Trust: Valuing trust, being seen as someone who can be trusted and building trusting relationships. Significance tests were conducted on these competencies between the men and women leaders. Women scored higher than men in Open-Mindedness and Adapting Socially. Men scored higher than women in Even Disposition. There were no differences among scores for the other six competencies. 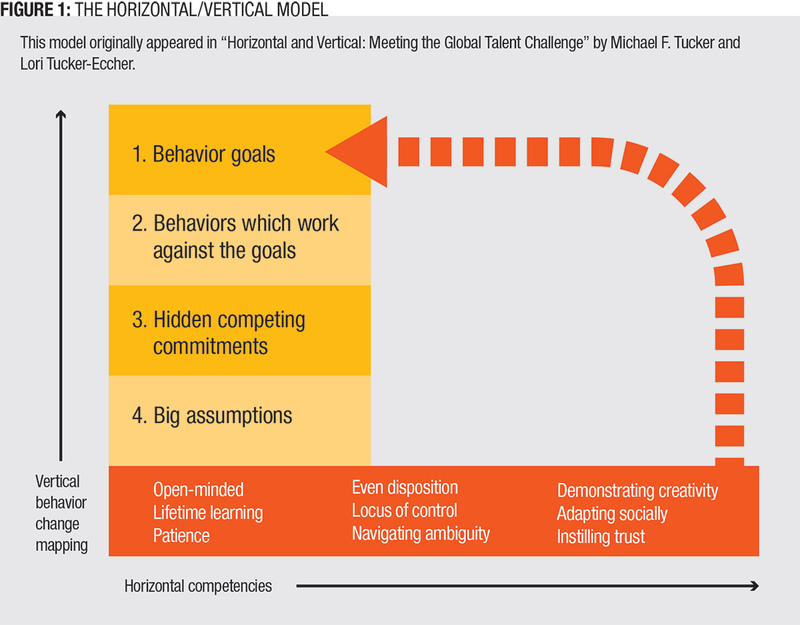 Enter vertical behavior change mapping. Once a leader’s horizontal competency assessment has been conducted, a behavior change map can be created. The full process is represented by The Horizontal/Vertical Model shown in Figure 1. Consider the following case study to illustrate how this model works by focusing on the Even Disposition competency. 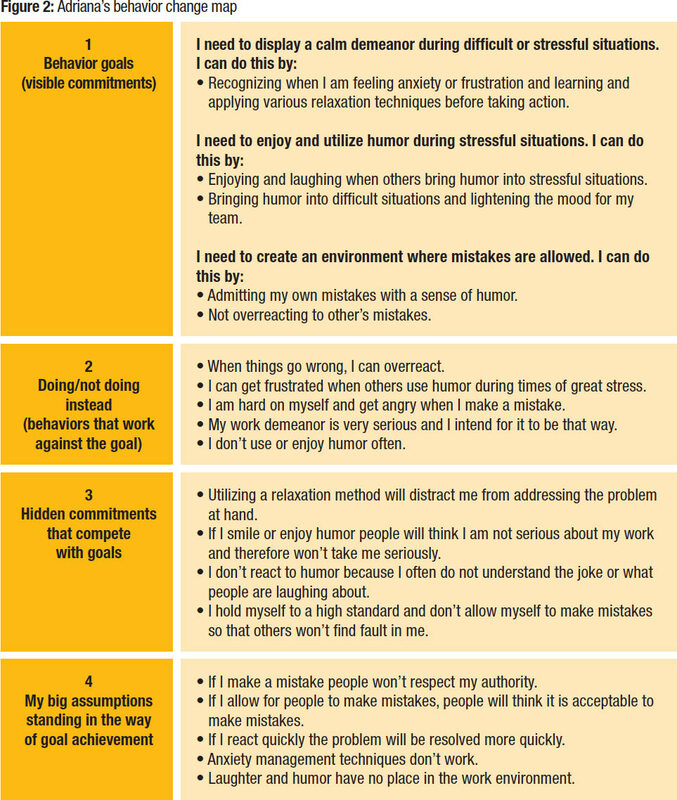 Working with a coach, Adriana created the behavior change map shown in Figure 2. Adriana and her coach confirmed that she was indeed engaged in the behaviors present in row 2. They then decided on the behavior goals listed in row one. However, just listing these goals (as is done in so many other development programs) does not achieve lasting behavior change. Additional steps of mental complexity are required. This mapping process, preceded by careful measurement of all nine competencies, can help all leaders become more successful in their roles. For organizations striving to unlock the leadership potential of more women in their workforce, the mapping process also can be a useful tool. According to Dweck, “the exciting part is that the growth mindset can be taught.” Adriana, for example, was able to move away from a fixed mindset to a growth mindset while simultaneously developing a more even disposition.